The meeting was called to order by president, Bob Beane, at 1:00 pm. Having made introductions during the preceding lunch/meet-and-greet period, the board was recognized by raising hands. The agenda for the meeting was then reviewed. Joe Perez, City of Phoenix, was not present due to schedule conflict, but hoped to arrive before the meeting concluded. As such, regional/community CAzB advocate discussions were moved to into this agenda slot. Glendale (presented by Gail Hildebrant) – Gail reported on the initiative to prepare a short bicycle-related law enforcement training course for the Glendale Police Department. As a foundation, a similar course outline from Cary, NC, was used with permission of the creators of that course. CAzB board and advisors reviewing/editing the material included Gail, Eric Post, Ed Beighe, Radar and Sharon Matt and Bob Beane. Gail’s presentation of the draft course materials was very well received by reviewers from Glendale PD. Instructor voice over will be provided by Glendale PD using agreed instructor text. Reviewers suggested the possibility of a second module in the near future, due to the amount of content not able to be included in the initial 15 minute course. The intention of the CAzB is to offer the same course content to all law enforcement agencies throughout the state in an effort to reach common understanding of Arizona Laws and related safe bicycling practices between bicyclists and law enforcement. Yuma (presented by Gene Dalbey) – Gene reported that he has had a number of successful contacts and meetings with Yuma County officials, the Mayor of Yuma and other city officials. The emphasis of his discussions has been bicycle safety. He has also taken the approach of “It’s about Yuma”, which can have tourism, economic impact and health aspect. One local perception is that there are some road cyclists exhibiting bad bicycle behavior. Gene put together a 100K major bicycling event for the Yuma Centennial, and is trying to follow that with at least one recreational ride per month. Gene noted that Yuma has a very high unemployment rate, and that a number of people ride bikes because they don’t own or can’t afford to operate a car. 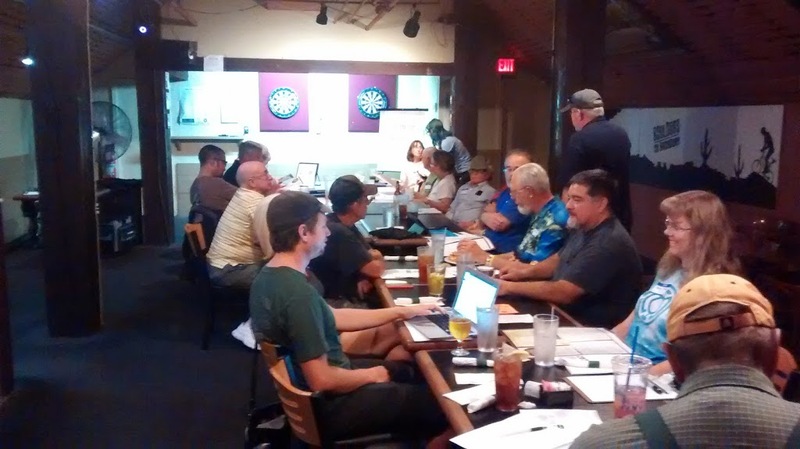 Gene is working on forming a Yuma Regional Bike and Pedestrian Advisory Committee, and is working on some signature events such as a closed-course ride on the General Motors test track that could draw participants from all over AZ and outside the state. Tucson (presented by Wayne Cullop) – Wayne reported that one of the main issues in Tucson are the trolley tracks near the University of Arizona. The Living Streets Alliance is compiling information on the numerous crashes related to those tracks. Regarding Tucson bicycling infrastructure, “The Loop” is a large loop route, mostly pathway, that is substantially completed but with a few remaining sections and challenges to be addressed. One issue on The Loop is the speed of some bicyclists, as the paths are shared with pedestrians and slower riders. Bob Beane noted that similar infrastructure in the SF Bay area has a 15 mph speed limit. Wayne also reported that GABA-Tucson is running a Bike Ambassador program that includes “Bicycling 101” education classes, bike maintenance classes, bike repair events, Cyclovia and Perimeter Bicycling bike patrol. There is a bike repair program available for Boys/Girls Clubs, grade schools, etc. Wayne also reported that the bicyclist diversion program is working well and is full (bicyclists cited for traffic violations may avoid driver’s license points by attending this educational program). Car/bicycle crash data in Tucson continues to be “scrubbed” in order to have the most accurate causal data possible. Michael Sanders, ADOT Bicycle/Pedestrian Coordinator, discussed priority topics related to ADOT and the Federal Highway Administration, as relates to bicyclists. ADOT’s Strategic Highway Safety Plan has been signed by Governor Jan Brewer. This plan includes as a priority non-motorized roadway users. As a result, some bicycle-related safety project could be funded by the FHWA (note: opportunity for advocates to identify and push important safety-related projects…can we include driver and bicyclist education in projects for funding?). FHWA also the following focus areas for AZ: (1) Pedestrians, (2) Intersections, (3) Roadway/lane departure crashes (note: rumble strips are the instinctive/preferred roadway engineer solution to this, which is generally not good for bicyclists’ available riding space and safety). How can bicyclists have a voice and make a difference? Get to know your ADOT District Engineer, and attend State Transportation Board meetings (held around the state…check their calendar). Anthony Quintile, Flagstaff Biking Organization (and General Manager of Absolute Bikes, Flagstaff) discussed the bicycling environment in Flagstaff. IMBA has made a grant for a bike park in Flagstaff. Flagstaff has a trail network and trail user events, generally weekly. FBO conducts both MTB and road cycling advocacy, organizes a Bike to School day (900 students this year), helps promote Bike to Work Week (this year, 13th annual, 1500 participants logged in), Mega Bike Rodeo (160 kids this year, 35 business sponsors). Flagstaff (City and County) has a texting and driving ban and bond issue on the ballot for roadway improvements that would benefit bicyclists. A recent ADOT pavement preservation project between Flagstaff and Snowbowl resulted in rideable paved shoulder the whole route. FBO has worked with Navajo school to change policy to allow bikes at dorms, and has an ongoing communication with Sheriff’s department to address a few issues that have come up with bicyclists (in particular, on Lake Mary Road). A number of lanes on streets have had sharrows added, and some green bike lanes are now in place. 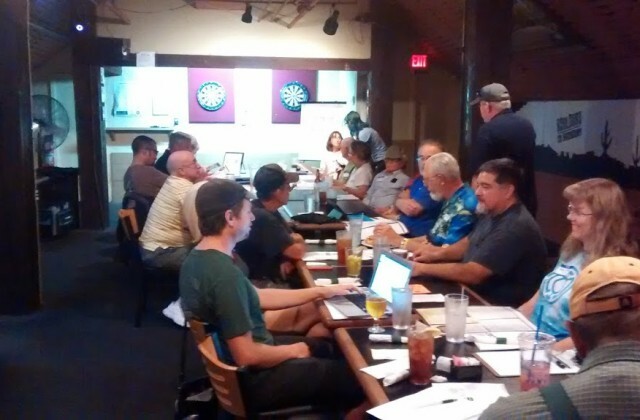 A discussion of CAzB’s role in AZ followed, which has historically been focused on education, non-lobbying advocacy, connecting and supporting local/regional advocates, outreach and participation in community/state organizations as a representative of the bicycling community. Wayne Cullop – Organize an annual meeting of all AZ advocates and a follow-up day visiting state representatives. Spencer Scharff – Web site upgrade. Two donations of $1,000 each were approved to We-Cycle; and The Yuma Mission’s bike program. (more on this later).